Jewish holiday programs, Jewish day camp, ongoing Torah classes, Mikvah, mom & me, Lunch and Learn, inspiring Jewish content updated every week. Learn and talk about jewish torah topics at this jewish forum website. Includes essays on various mitzvos (commandments), prayers, and philosophical concepts, plus a collection of biographies of prominent Jewish leaders. Also a Torah chat room, and questions answered. A Jewish kids site. Sections include childrens Parsha, Jewish holidays, Israel, Hebrew, and Jewish heroes from the Torah. Thoughts on the weekly Torah portion, from the Jewish community of Atlanta. A website for jewish learning, shidduchim, fun, chat and everything Torah. A collection of Jewish subjects and topics from travel and Torah to Talmud and television. Publisher of 'Jewish books, broadly defined.' From Torah commentaries to Jewish renewal, from fiction to journalism, including some of the most innovative voices in the Jewish community. Basic table of contents for the Torah (including the entire Jewish Scriptures and the Talmud) with an explanation of the concept of the written and oral laws. Includes sections about Childrens Parsha, Jewish holidays, Israel, Hebrew, and Jewish heroes from the Torah. Offering a variety of Torah scrolls, tefillin and Jewish religious items. Restoration of old Torah scrolls is available. Personalized Torah education for women, focusing on practical learning and integrating Torah and Mitzvot into daily lives. Interactive online Jewish games about Torah and Jewish life. Jewish Art by Ruth Pasder - Hand made parochet, veil, kettubah, torah robes. Beautiful touches to Jewish religious festivals and family occasions. Jewish themes - Israel, Jerusalem, Beit Hamikdash (the Holy Temple). Torah-Judaism-friendly Jewish jokes from Jewish America. A Jewish web site for Judaica topics, singles, ask a rabbi, Torah, news and chats. Israeli publisher and seller of English language Jewish books, including Jewish law and modernity, spiritual and meditative works, women in Judaism, original and classic Torah commentaries, Zionism, modern biographies, Jewish thought, and childrens stories. Jewish interest, information, products, and services. 'Presenting the vibrance of Torah life'. Articles about new Torah writing fundraisers, caring for aging scrolls, how and why Torah and mezuzah scrolls are created, and bridging the oral and written Torah from scribe Rabbi Shmuel Miller. Cleveland based Jewish radio program featuring,community updates, interviews, call-ins, Israeli news and Torah, various types of music and a live webcast. Jewish learning, holidays, essays on Torah viewpoints, Jewish life, and self improvement. Events for the Flatbush Jewish Community. Educational clubs for kids, singles events, ladies learning and workshops, Torah for adults, education forums and youth programs, a Yeshiva and synagogue (shul) and Jewish outreach programs. Submit or read: Torah commentaries, sermons, adult bat mitzvah talks, new liturgy, plus message boards and an online Jewish feminist bookstore. Source of local Jewish information, including Torah study, and upcoming local events. Includes special Jewish holiday links. Contains the complete contents the 1906 Jewish Encyclopedia. Over 15,000 articles and pictures about the Torah, history, literature, biography, geography, genealogy, and theology. Accessible for free and full-text searchable. Beth Or is small and intimate congregation devoted to the renewal of Judaism though Torah study and spiritual practice. A member of the Jewish Reconstructionist Federation and aligned with the movement for Jewish Renewal, Beth Or offers an inclusive, egalitarian, and spiritually focused environment in which children and adults can deepen their understanding of, and commitment to, Jewish life and community. Comments on current affairs, discussions of Torah life, and some halakhic rulings. Includes Parsha on Parade and Holidays on Parade, a series of stories, educational material, fun and games, coloring pages for Jewish children. Serving the area with a synogogue, hospitality house, hospital visitations and counseling. Source of local Jewish information, including Torah study, and upcoming local events. Includes special Jewish holiday links. The story of the Jewish prophetess. Brief profile of the Jewish prophetess. If the business hours of Lubavitch Chabad of Peoria, IL in may vary on holidays like Valentine’s Day, Washington’s Birthday, St. Patrick’s Day, Easter, Easter eve and Mother’s day. We display standard opening hours and price ranges in our profile site. 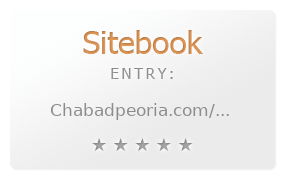 We recommend to check out chabadpeoria.com/ for further information. You can also search for Alternatives for chabadpeoria.com/ on our Review Site Sitebook.org All trademarks are the property of their respective owners. If we should delete this entry, please send us a short E-Mail.